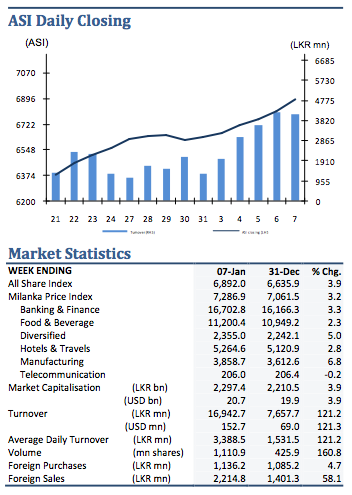 Colombo Bourse initiated 2011 on a positive note with the market falling in green throughout the week. The All Share Price Index (ASPI) gained 255.71 points to close at 6,891.6 points (+3.9%) whilst Milanka Price Index also gained 225.0 points to close the week at 7286.4 points (+3.2%). Indices gained mainly on the back of the gains made by Bairaha Farms (+25.8% WoW), Ceylinco Insurance (+18.4% WoW), Aitken Spence (+14.4% WoW), Sampath Bank (+8.5% WoW), John Keells Holdings (6.3% WoW) and Commercial Bank (+5.8% WoW). Volume levels in the market soared on the back of lively investor sentiments where strong retail participation was evident. The turnover levels were supported by individual investors, where the institutions were seen less active during the week. 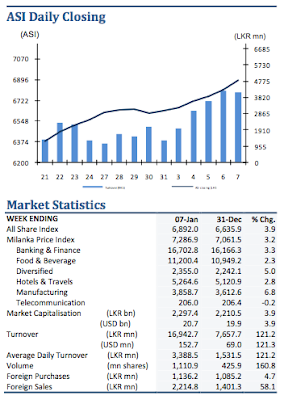 Further, the market recorded an average daily turnover of LKR3,387.3 mn over the past week together with a average volume of 222.2mn. Heavy weight John Keells Holdings emerged as the top trader for the week contributing circa 8% of the week’s turnover where it grabbed institutional and foreign interest over the week. Richard Pieris witnessed strong retail participation, subsequent to CSE announcing its stock broking arm Richard Pieris Securities Pvt Ltd being initiated as a Stock Exchange Member. Meanwhile, heavy interest on Laugfs Gas was witnessed, after announcing on its Joint Venture agreement with Bharat Petroleum and the LKR500 mn investment in a Mini hydro project under Laugfs Power Ltd. Further, Pan Asian Power commenced trading on Friday where its price appreciated by 23% to close at LKR3.70. Investor involvement in poultry sector soared throughout the week with counters such as Ceylon Grain Elevators and Bairaha Farms making a mark on week’s turnover levels. Information sector counters witnessed high participation where PC House gained 20% over the week whilst E Channeling announced that it will be entering the Maldivian market together with Watanlya Telecom Maldives Pvt Ltd. Further, Ceylinco Insurance acquired 10.7% share of Dunamis Capital during the week. proclaimed that it’s amalgamation with Alucop Cables was finalized. East West Holdings announced a right issue of 3 for121X at LKR10.00. LKR40.00 per share during the week. 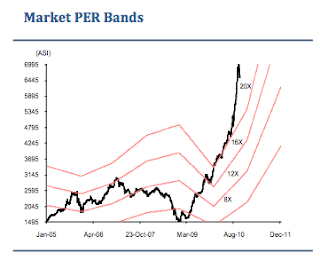 margin is required for purchase of securities over the value of LKR20mn as at 4 Jan 2011.